A mile up Highway 61 from Cross River the Temperance River, the focal point of Temperance River State Park, plays host to the dangerous beauty of Hidden Falls. A series of cascades brings the river down 162 feet through a rocky gorge within the space of only half a mile. The last cascade drops just one hundred feet from the river’s mouth. 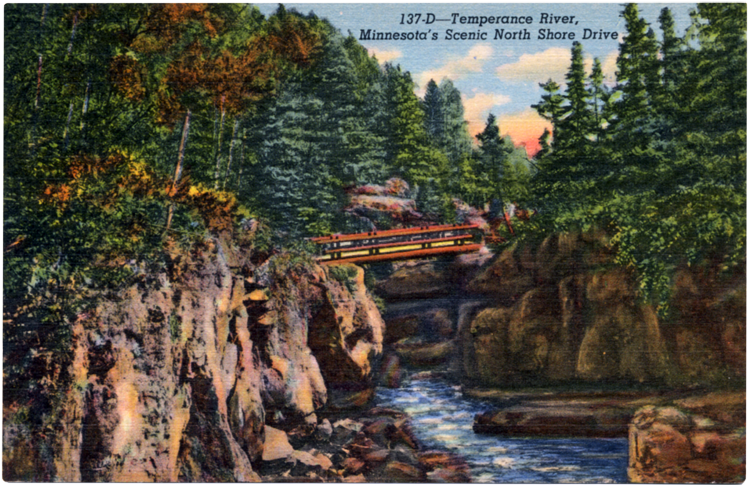 Along this span, the river’s erosive power has carved deep cauldrons into the native rock, thus “hiding” the falls (also called the Temperance River Gorge). Missteps have led to tragedies over the years, as hikers have accidentally dropped into the gorge.